Rafting down the Class V Argut River is a serious matter. This route is for those who has tried oneself in whitewater rafting and is ready for a river trip difficult enough to get the maximum dose of adrenalin. You must have previous high water class IV rafting experience. This difficult river has had many crazy stories come from the limited number of journeys through its beautiful canyon. This river is for experienced rafters who like power of "heavy" water. This is not a technical river, but rather one with big hydraulics requiring little maneuvering. The highlight of this river are the narrow gorges and beautiful rocky canyons with vertical walls. The banks of the river rise step by step and shelf by shelf to the snowy Katun' range of the Altai mountains. Another highlight of this rafting trip is the opportunity to hike up Belukha Mountain. Vlad has so much respect for the power of this river that he named his feisty, untamed German Shepard after it. Both the river and the dog are wild creatures. Arrive in Barnaul and travel by bus to the settlement of Kosh-Agach. Overnight in tents. Travel by truck to the Put-in point on the Argut river. Rafting the upper scenic section of Argut and camp above the Nadolby rapid. Rafting the class IV+ to V rapids Nadolby and Truba Sapozhnikova (‘Sapozhnikov’s Tube’). Portage the Sapozhnikov Waterfall. Running class III+ to IV rapids Ary-Yulskiy, Belyy (‘The White’), and Zub Elo’. Portage of the Razdelnyy Rapid. Running the class III to V rapids Tuganskii, Tikhonya, Atlanty (‘The Atlantis’), Vorota (‘The Gate’). Camping at ‘Cafe Argut’ – a place near the confluence of the Argut and Katun rivers. Lay-over day. Go for a hike in the nearby mountains and return for a river sauna. 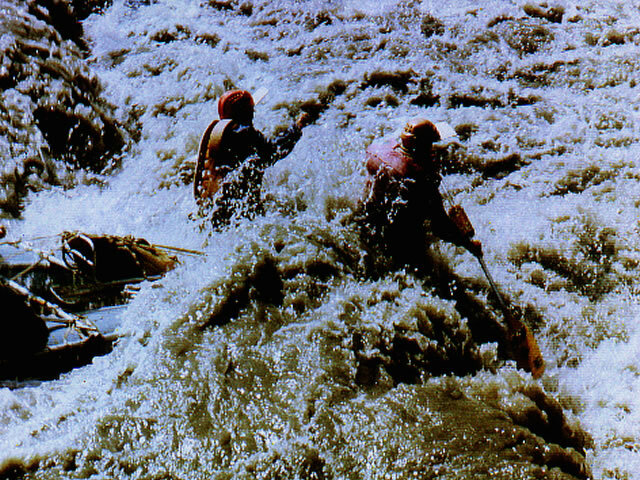 Rafting down the Katun to take-out at the mouth of the Big Yaloman river. Bus trip to Barnaul. Hotel accommodation. We can run an Argut River trip at any time of the season with a minimum of six participants. If a specific trip date has fewer than six participants the tour price may be increased. Meals to the put-in and from the take out are not included in the tour price. This is a class V river, previous class IV experience is required.